Channel delays: Brittany Ferries Portsmouth-Santander delayed by bad weather, check-in from 19:00. Bilbao-Portsmouth delayed until 17:30. Weather alerts: Amber alerts heavy snow south east France and west Switzerland, high winds north east Spain, heavy rain Austria, high winds and heavy rain Croatia and storms southern Italy and Sardinia. Weather: Heavy snow Alps and high ground France. Heavy rain, strong winds Mediterranean. 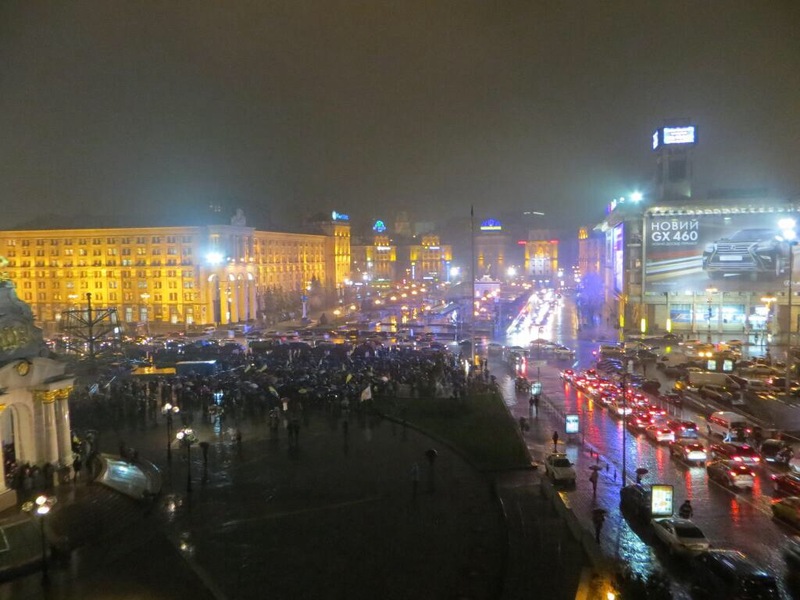 Chicken Kiev: nine years to the day since the start of the Orange Revolution, protestors were again out in the streets of the Ukraine capital last night though in the hundreds rather than the thousands. The government announced yesterday it will not sign the Association Agreement with the EU at next week’s Vilnius Summit. Precisely why it ducked out at the last minute is unclear, one commentator said the Russian stick was bigger than the EU carrot. The dream of driving in Ukraine, with fully comprehensive European insurance, recedes but don’t give up yet: a week is a long time in geopolitics. Pic via @UKroblogger. roundup: ITALY. A lawyer caught running a red light in Turin has reported the local mayor for ‘usury’, unethically adding interest, after the unpaid fine nearly doubled to €323. We can see this one going all the way. BELARUS. A new website shows real time weather conditions via webcam on the major road network. Also, €1m of EU funds has helped pay for next gen. radiation detectors at border crossing points with Poland and Lithuania. Around 10m vehicles cross the border each year. So far this year four vehicles were denied entry due to ‘unacceptably high’ levels of radiation with another 150 subject to detail checks. ROMANIA. Perhaps surprisingly, the first European country to implement eCall is Romania. The system automatically alerts emergency services in the event of an accident, including location and technical details of the vehicles involved. Local operator Special Telecommunications Service (STS) has been demonstrating the system to 18 other EU countries at a conference in Bucharest this week. eCall transponders are likely to be mandatory in all cars sold in the EU plus Norway and Switzerland by 2015.